The last few weeks we talked about skiing and snowboarding at Mammoth and June Mountain. However, they are not the only two enjoyable winter activities available in the Eastern Sierra. There are also plenty of places to go snowmobiling within easy access of our Mammoth Lakes condos. In total, the Mammoth Lakes region is home to at least 80 incredible miles of groomed trails as well as ungroomed areas that people can explore alone or with a guide. 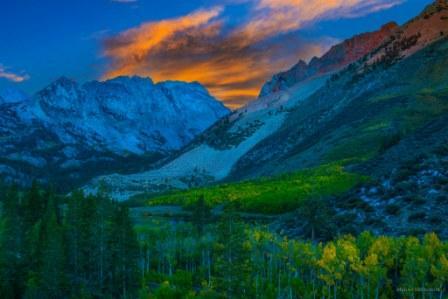 Some of those trails are located within the Inyo National Forest’s Mammoth Lakes Ranger District. The ranger station is typically open daily, year round from 8 a.m. until 5 p.m. It’s a good spot to stop and pick up trail status information. Beginners may want to check out the Hot Creek Ski Trail. It offers fairly easy going terrain and a chance to see the Hot Creek Geological site. The site features various size hot springs. The list of other popular trails within the forest’s confines includes, but isn’t limited to Inyo Craters, Minaret Vista, Sherwin Creek, Crater Flat and the Bald Mountain Lookout. The Bald Mountain Lookout trail has three main things of note, sweeping views, a 9,104 foot elevation and a small, quaint warming hut. So you may want to save it for end of your snowmobiling day. While you’re there, don’t forget to sign the guestbook and look at the signatures of those that have been there before. If you don’t want to cart your own snowmobiling equipment to our Mammoth Lakes condos, you don’t have to. There are several places in the area that provide rentals as well as the guided tours that we alluded to earlier. Among them are DJ’s Snowmobile Adventures and Mammoth Snowmobile Adventures. In most instances, rental clothing and helmets are available onsite too. Be sure to bring your valid driver’s license though. You are going to need it in order to secure your snowmobiling rentals. After snowmobiling, you’ll be able to return to your Mammoth Lakes condos, thaw out and relax for the night. Mammoth Lakes condo amenities understandably vary per unit. However, some may feature hydronic heating, gourmet kitchens and ski-in/ski-out capabilities. To learn more about securing Mammoth Lakes condos for yourself and hitting the Eastern Sierra’s snowmobiling trails, please contact us at (855) GO-MAGGIE. While you’re at it, be sure to “Like” our Facebook page and share your snowmobiling tips with others.